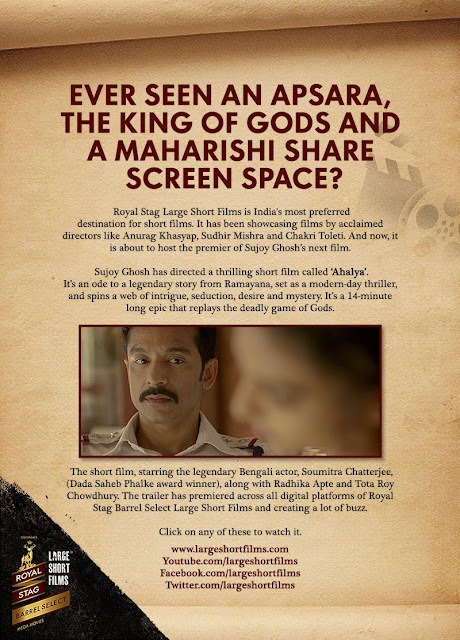 Royal Stag Large Short Films, known for showcasing films by the likes of Sudhir Mishra and Anurag Kashyap, presents the trailer of a thrilling short film called 'Ahalya' by filmmaker Sujoy Ghosh, who previously directed the 2012 blockbuster Kahaani, starring Vidhya Balan. Ahalya, set as a modern-day thriller, is being described to an ode to a story from Ramayana. The 14-minute-long film replays the the deadly game of Gods, spinning a web of intrigue, seduction, desire and mystery. The short film stars the legendary Bengali actor Soumitra Chatterjee alongside Radhika Apte and Tota Roy Chowdhury. The exhilarating trailer that has been premiered across various digital platforms is already creating a lot of buzz. After watching the trailer, I can safely say that Sujoy hasn't lost his Midas touch. Now it remains to be seen how deadly the game of Gods actually turns to be. For now, enjoy the ravishing Radhika Apte who is certainly dressed to kill as our bewitching Apsara!